The 100: Is The CW Show Cancelled or Renewed for Season Five? How do you fight nuclear fire? Has The 100 TV show been cancelled or renewed for a fifth season on The CW? The television vulture is watching all the latest cancellation and renewal news, so this page is the place to track the status of The 100 season five. Bookmark it, or subscribe for the latest updates. Remember, the television vulture is watching your shows. Are you? Airing on The CW television network, The 100 follows a group of young people who are sent back to Earth nearly 100 years after a nuclear Armageddon destroyed civilization. The cast includes Eliza Taylor, Paige Turco, Bob Morley, Marie Avgeropoulos, Devon Bostick, Lindsey Morgan, Christopher Larkin, Richard Harmon, Zach McGowan, Isaiah Washington and Henry Ian Cusick. The fourth season The 100 averaged a 0.34 rating in the 18-49 demographic and 955,000 viewers. Compared to the season three ratings, that’s down by 30% in the demo and down by 28% in viewers. Learn how The 100 stacks up against the other CW TV shows. On March 10, 2017, The 100 was renewed for a fifth season which will debut April 24, 2018. Stay tuned for further updates. Because the network chose to hold the premiere until the mid-season, it may take some viewers time realize The 100 has returned. For now, I will keep my eye on this show and see if it picks up as the season continues. If you’re in the mood for a wild guess: right now, I suspect The CW will pick up season five of The 100, to give it more episodes for a syndication package. 3/9 Update: The CW has renewed The 100 for season five. Details here. TV show ratings are still important. Follow The 100’s weekly ups and downs. Check the rankings for all of The CW’s 2016-17 TV shows. Find more The 100 TV series news or other CW TV show news. Explore The CW status page and other TV show status pages. What do you think? Are you happy The 100 TV show was renewed for a fifth season? How would you feel if The CW had cancelled this TV show, instead? 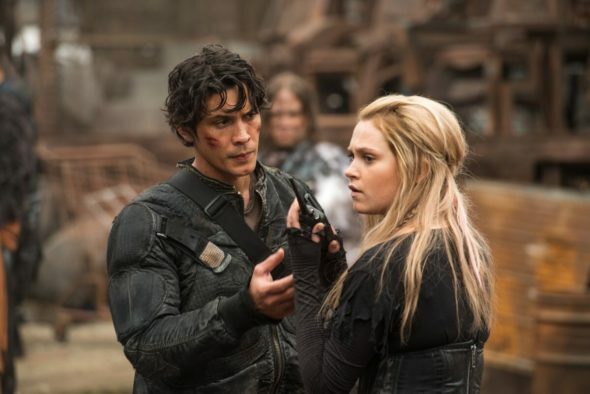 More about: The 100, The 100: canceled or renewed?, The 100: ratings, The CW TV shows: canceled or renewed? Penn & Teller: Fool Us on The CW: Cancelled or Renewed for Season Six? Dynasty on The CW: Cancelled or Renewed for Season Three? The 100 on The CW: Cancelled or Renewed for Season Six? The Flash: Cancelled or Renewed for Season Five on The CW? Penn & Teller: Fool Us: Is The CW TV Series Cancelled or Renewed for Season Five? Hooten & The Lady: Cancelled or Renewed for Season Two on The CW? DC’s Legends of Tomorrow: Cancelled or Renewed for Season Three? The Flash: Has the CW Series Been Cancelled or Renewed for Season Four? Reign: Cancelled or Renewed for Season Five on The CW? Frequency: Cancelled or Renewed for Season Two? It’s a terrible show can’t believe it made it past season one.